A dramatic nature coastline of rugged rocks, the Wairarapa is shaped by the rough Pacific Ocean as it surges up and down the shoreline and through the Cook Strait of NZ. The brilliant light of sunset lights the clouds above the Cook Strait as the Pacific Ocean pummels the shores of the Wairarapa nature coastline on the North Island of New Zealand. Cook Strait is a body of water which joins the North and South Islands of NZ and is a treacherous portion of coastline along the Wairarapa shores. The Pacific Ocean and Tasman Sea meet in the Strait which has claimed many lives. 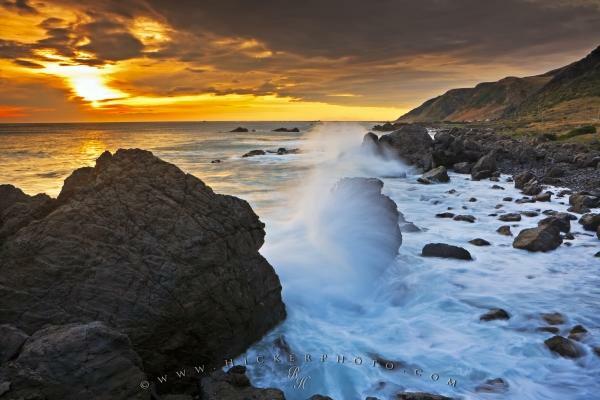 The Wairarapa coast offers many beautiful coastline views and many opportunities for nature photographers. Southern Wairarpa coastline, Cape Palliser, Wairarapa, North Island, New Zealand. Make sure to see all our ocean pictures and photos and our special selection of beautiful pictures. Wairarapa coastline on the North Island of NZ.